If I don’t write about this day, I can pretend we will ride on to the next destination. Our tour won’t have ended, D.C. won’t be calling me home. But our final day on the road is over. We are in Portland now, our journey from Sacramento to Portland complete, and Felkerino breaks down the bike as I type. I began our 11th day of riding with heavy legs, but not really because they were tired (though they are). I wanted to drag my feet and make our trip last longer. Today was a gorgeous day on the bike, despite the cantankerous head- and crosswinds that accompanied us most of the miles. Maybe the winds knew how much I wanted our tour to last. 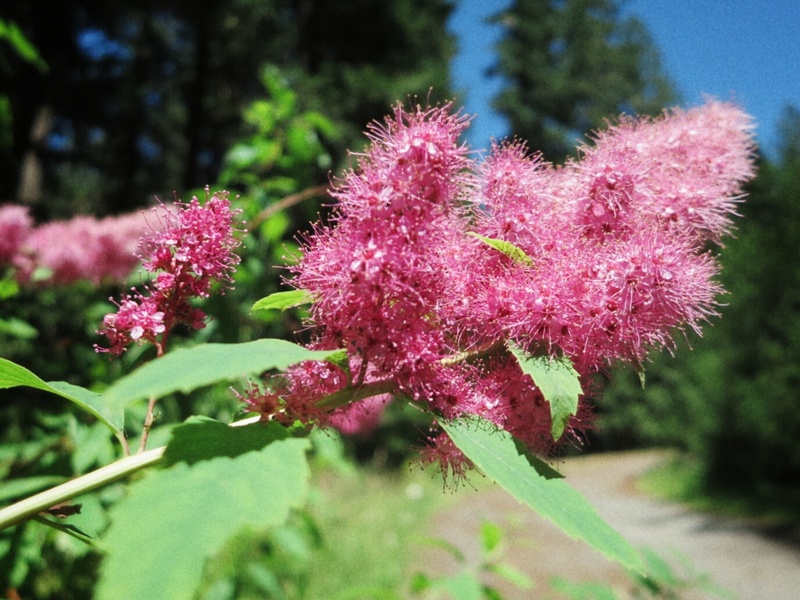 Early hours were sunny and mild, and we encountered very little traffic until reaching Estacada and entering the outskirts of Portland. This was the ride I’d missed out on en route to Detroit. The Oregon Bikeways audit group continued their work and they invited us to share our thoughts on one of the segments they were evaluating. This group is awesome and so inclusive. I wanted to hop in their truck and start working for one of their organizations on the spot. See you, Felkerino! I’m staying here to talk good roads and bike transportation forever and ever. But wait, that’s not true. 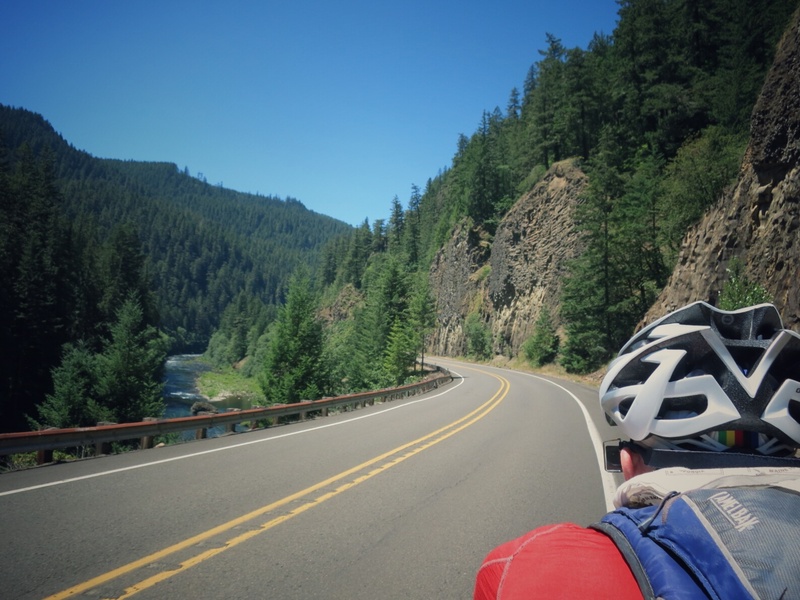 I couldn’t leave Felkerino so we finished our conversation and headed over rollers to spend a few hours in the company of the Clackamas River. Not quite close enough to the road to entice us for a dip, we simply followed its curves, carved gently against the mountainsides. Felkerino remarked on how quiet I was, but he didn’t know how caught up I was in my end of tour emotions. Our tour of the Sierra Cascades optimally blended riding and rest. We averaged 94 miles each day, but our fitness tolerated that distance well, even with the hilly terrain we covered. We didn’t do much more than eat, ride, and sleep, but this mileage allowed us to take various breaks during the day. With the exception of our first day, which was 147 miles, I did not feel pressured by time. We just rode until we got there. Pretty simple strategy, really. The weather also worked in our favor, something you can’t plan for, even though you do your best educated guessing based on average temps and weather for the area you intend to travel. I loved wearing a jacket and knee warmers in July. One of the only aspects I would change is to see if there were some quieter stretches away from the main highways that we could have used. I suspect that wouldn’t always have been possible without either going off the pavement or adding significantly more miles to our route. When we finally rode up to our hotel after riding 108 miles, I felt a rush of relief and satisfaction. We made it. Everything worked out for us, and that’s always a lucky feeling. I’m ready to return home, mostly, and for a couple of days off the bike. Can’t live out of one-gallon baggies forever. Not yet, anyway. Thanks for following along, everybody. I was part of the Scenic Bikeway Audit Group. So nice to meet you and Ed in Detroit and then during your ride on Thursday from Detroit to Portland. 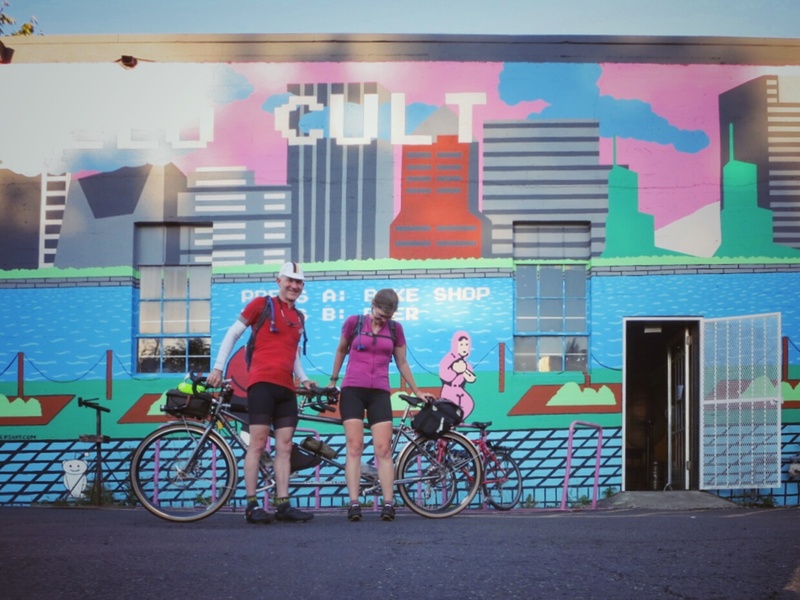 Glad you made it safe and sound to Velo Cult in Portland. Great job. And safe travels in the future! BTW – Rebecca who got stung by the bee is fine and made it back to Bozeman. Likewise it was so great to meet you, and thank you for the update! I am so relieved that Rebecca is okay. Thanks for reading, Jim. I really enjoy being able to put together impressions of our tour as we ride it because I want to capture what immediately stayed with me. It’s a different kind of writing than letting time pass and then putting something together. Likewise! A nice surprise to cap off the trip. We had a great tour of the Sierra Cascades! Always great to read your posts and I enjoy tagging along vicariously. I’m already looking forward to your next trip! Hi Lynda, thank you for encouraging us along the way. Knowing that others like to read about what we’re doing is a great inspiration for the writing. What an awesome trip very velo jealous! I see you hit Velo Cult in PDX a place I try to visit whenever I visit PDX from Seattle, Cool bikes, beer, coffee, sometimes live music -why would you ever leave? Oh and one minor edit – its Clackamas with a C …sorry, Clackamas High School class of 82. Thanks for sharing your inspiring tour. Thanks for noting that, made the edit. It was a great trip! Already thinking about a future tour out that way again.